Aside from those who have an allergy, we can say that most of us love peanuts! But if we talk about dogs, do they like em, can dogs eat peanuts safely without getting sick. It is a healthy and nutritious treat and can be found in plenty of dishes and desserts. As much as we love peanuts and its varieties, some dogs are also fond of it and the peanut flavor. But when it comes to feeding peanuts to our dogs, we should think long and hard if it is not toxic and deadly for our canine buddies. Most dog owners are unaware thus, they conduct research or talk with their veterinarian about nuts and dogs which is good. Peanuts are packed with proteins and numerous vitamins and minerals, which actually make it ideal for dogs. However, there are some drawbacks such as high levels of fats. Peanuts are also loaded with fiber thus, your dog might have difficulties digesting it. 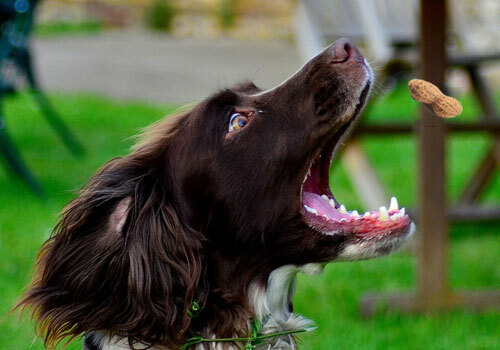 Let’s get to know more how dogs and peanut butter or peanuts can be a winning combination! Is Peanut Butter Good for Dogs to Eat? In general, peanuts are safe to be given to your furry friend. It is not considered a toxic food or harmful ingredient unlike other variations of nuts such as pistachio and macadamia nuts. You can also find dog snacks, treats and dog biscuits with peanut butter as an ingredient or flavor. Peanuts are a great source of the healthy fats or monounsaturated fats. It promotes heart function and reduces the risk of cardiovascular diseases. It contains vitamin E which helps in maintaining your dog’s coat and skin healthy and shiny. It has Niacin, which is effective in keeping proper blood flow, brain circulation and improves brain health. Peanuts are also rich in protein, manganese, and folate, that will keep your dog healthy against diseases. It also contains fiber, which sustains better digestion, keeping your dog’s colon clean. This can lower his risk for colon cancer. Calcium is also present in peanuts, and we all know that they need calcium to develop strong joints and bones. Calcium is also beneficial for aging dogs as it can lower their risk of bone-related problems. Like humans, peanuts are ideal for adult dogs as it has resveratrol, a compound known to fight cancer and memory loss or Alzheimer’s disease. Resveratrol also has anti-aging properties. It also has Coenzyme Q10, which maintains oxygen flow in the dog’s heart. The antioxidants found in peanuts helps lower the risk of coronary diseases that most adult dogs are suffering from. Peanuts have plenty of health benefits, especially for aging dogs. Aside from the usual vitamins and minerals, it helps slow down or even prevent age-related cognitive decline. However, too many peanuts will also result in health issues, thus, it should be given moderately. Some dogs could also develop peanut allergies, even if they have been eating peanuts for a while. Food allergies do not manifest in an instant so make sure to monitor your dog’s condition and have a regular checkup with the veterinarian. Are Peanuts Bad for Dogs? 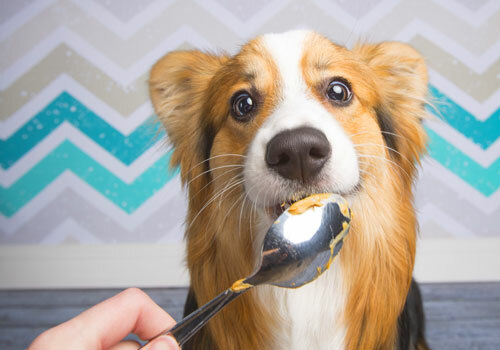 Is Peanut Butter Bad for Dogs? If peanuts are healthy and safe for dogs, how it could be toxic to them? Despite the various health benefits of peanuts, it may also harm your canine buddy because of many reasons. Some owners fail to understand the Do’s and Don’ts of giving peanuts to their pets. First, proper preparation is important. You shouldn’t give your dog, peanuts with shells. It may cause him a stomach ache, stomach upset or diarrhea. Peanut shells also contain a significant amount of fiber, which is also bad for dogs. It can be hard for them to digest the shells. Moreover, the peanut shells may contain mold known as Aspergillus flavus. This produces the substance called aflatoxinm which is a toxic substance for both dogs and humans. It can cause them serious health problems and may even lead to mental retardation. Another thing to consider is the high amount of fats found in peanuts. Too much fat can also ruin your dog’s digestive system. 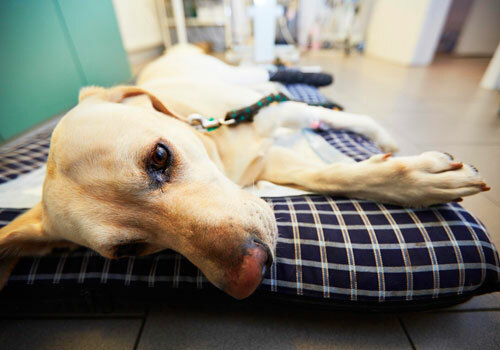 Dogs may experience diarrhea, vomiting, and painful stomach. The worse is that it can lead to pancreatitis, which is a serious disease. As discussed earlier, dogs can develop an allergic reaction to the foods they eat such as peanuts. If you notice that he is scratching excessively, his tongue is swelling or is having a skin rash, he might just get an allergy. If not treated properly, this can lead to a more serious health condition. There are other situations which will prohibit you from feeding peanuts to your dog. If the dog is suffering from the gallbladder or kidney-related problems, peanut butter for dogs should be avoided. It is also advisable to store the peanuts in a high-quality environment to keep it fresh. This will reduce the risk of developing fungus in the peanut shell. If you are giving your dog a little serving of peanut butter as a treat, avoid giving him chunky varieties as it may choke them, especially young dogs. Salted peanuts are also not good for dogs, so you should opt for low-salted or low-sodium peanut and peanut butter. These instances are the reason why sometimes, it is not okay to give peanuts to your dogs. Still, it will be based on your dog’s preference and overall health condition. How to Prepare Peanuts for Dog? Proper preparation of foods is important for your dog relies on you when it comes to his nutrition. Be aware that you should only give your dog peanut or peanut butter that is absolutely low in sodium and low-salt. Likewise, make sure to remove the peanut shells before you feed it to your dog. The hard texture of it could result in serious damage to your dog’s intestine and digestive tract. When buying peanut or peanut butter, make sure that the products are stored in a cool and dry place. High humidity causes rapid growth of Aspergillus fungus. Raw peanuts are also ideal since it is protected from fungus and can be easily digested by dogs. 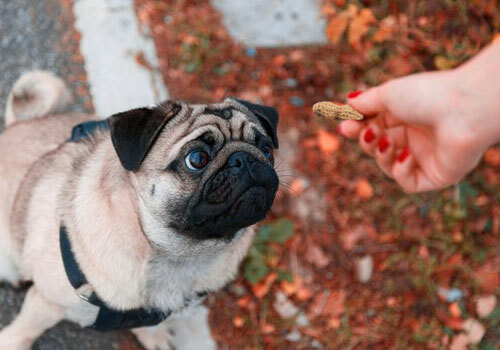 Raw and roasted peanuts are safe for canines, however, treats with peanut ingredients that are specifically made for human consumption should not be given to them. Candy bars, chips, peanut butter cups, and cookies with peanuts could contain other food ingredients which are poisonous to dogs. Macadamia nuts should be avoided as these can be toxic to dogs due to excess fats it contains. Almonds, pecans, and hickory nuts are also considered “Bad nuts” and should not be given to dogs. If this is your first time to feed Fido with peanuts, give him only 1-2 pieces. See if it can provoke immediate reactions. Moreover, this will help you gauge your pet’s response to peanut. Too many peanuts for the first time may cause him diarrhea or indigestion. My Dog Ate Peanuts and Shells! What Should I Do Now? Be extra cautious about how you will feed your dog peanut or peanut butter. Dogs tend to be super excited when it comes to treats thus, some of them accidentally swallowed the spoon with peanut butter on it! Always make sure to control the treats you are giving your dog. If you are feeding him with peanut butter after some dog training, a small spoonful would be great. Just make sure that your pet has no kidney issues and is overall healthy. Like other fruits and snacks, peanut and its varieties work great as a treat only. Remember that dogs don’t actually chew their food. They just swallow the entire food so giving him a bowl of peanuts is not a great idea. A handful of peanuts is fine once in a while. If your dog happened to eat too many peanuts all at once, look for signs of allergic reactions, constipation, stomach upset or choking. Call the vet immediately if any of these symptoms are present. As much as possible, give him peanuts on occasions. Never make it a habit to frequently feed him treats. If you’re still in doubt as to whether can dogs eat peanuts, I’ve summarized the article in a few frequently asked questions below. Be sure to remember and follow them. And feel free to pop any queries about peanut butter and dogs that have remained unanswered in the comments below! 1. Can dogs have peanuts? Are peanuts ok for dogs? YES. 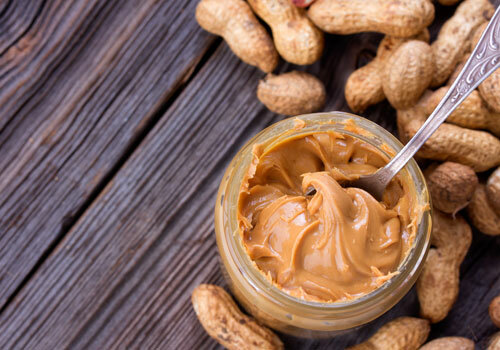 Peanuts and peanut butter are safe for dogs as long as you follow proper preparations. Remove the peanut shells and make sure that the peanuts are fresh and of high-quality. They also come very handily when Fido needs to take his medicine or during his training sessions. Peanuts are very nutritious, and it can be your powerful tool to keep your pet motivated during activities. 2. Can dogs eat peanut shells? Are peanut shells bad for dogs? Absolutely no! Peanut shells are hard to digest and can cause physical damage to your dog’s intestines and can lead to gastrointestinal problems. These shells might also have fungus which is deadly to dogs. Save yourself from a whole new world of problems and just skip the peanut shells. Opt for creamy varieties such as peanut butter for easy digestion. 3. Are dogs allergic to peanuts? Or peanut butter? 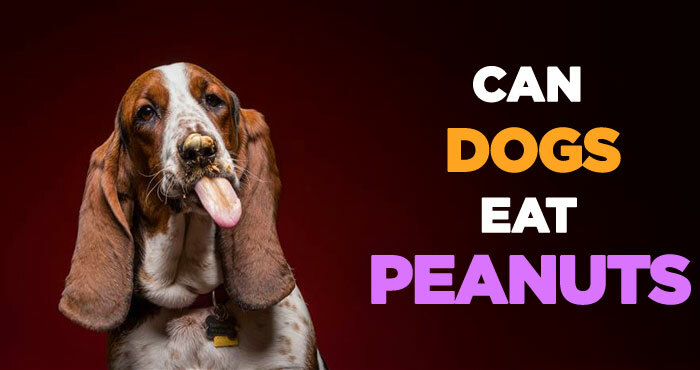 There is a possibility that a dog is allergic to peanuts, but not all of them can feel the same. 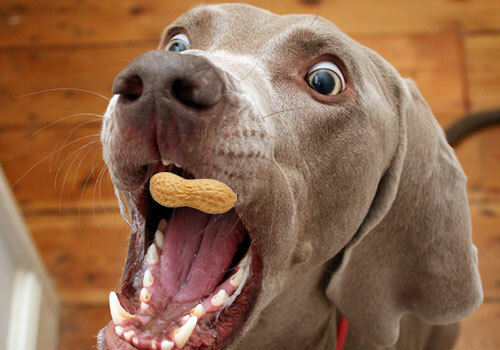 Food allergens can just appear even after your dog is already accustomed to eating peanut as a treat. Remember that food allergies among dogs develop over time and do not manifest in an instant. Feed your dog very few amount of peanut first to determine if he has allergic reactions to it. 4. How many peanuts can a dog eat? There is no exact amount of peanuts or peanut butter recommended for dogs, but still, these should only be given as a reward or treat. Do not make it part of their daily meal. A small spoonful or 2 pieces of peanut butter once in a while are fine. Just make sure that you are only giving him 100% natural peanut and peanut butter. Choose organic brands. 5. Can dogs eat peanut butter? Is peanut butter safe for dogs? Your dog can eat peanut butter as long as it is naturally made, low-salted and does not contain xylitol. This is a substitute for sugar, which is very harmful and potentially deadly to canines. Avoid peanut butter products that say “sugar alcohol” or “natural sweetener” in their labels as these are hints that the product includes xylitol. It may be safe for humans, but not for dogs. The slightest amount can lead to a serious health problem. 6. Can puppies eat peanut butter? Is peanut butter safe for puppies? A few pieces of peanuts would be okay, but instead of giving puppies whole peanuts, peanut butter for puppies is a great substitute. It is in creamy form so puppies can easily swallow and digest it compared to whole peanuts. Whole peanuts can choke puppies or can cause them diarrhea. Give peanut butter treats occasionally as these puppies should be given puppy dog food formula to sustain their growth. So can dogs eat peanuts safely? Absolutely. There is no doubt that peanuts are highly nutritious and safe for your dog. It is one of the healthiest treats that won’t cost you a fortune. 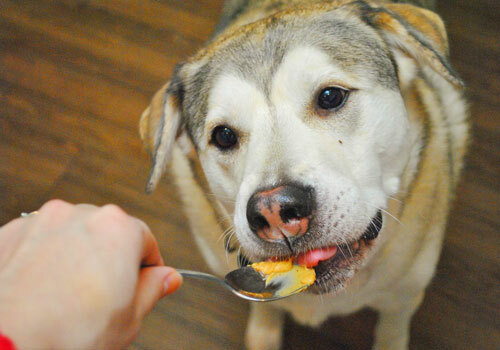 Aside from being nutritious, peanut butter is beneficial to your dog’s oral health. There are toothpaste for dogs that are peanut butter flavored! Cleaning your buddy’s teeth will be much easier, and they will easily submit to brushing their teeth. But no matter how healthy a dog food is, do not overdo it. 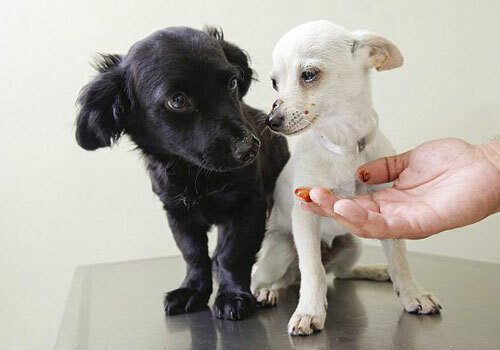 You still have to limit consumption of peanut and peanut butter for puppies and dogs. Make it a treat and not part of his meal. You don’t want him to suffer from pancreatitis. For more information and concerns about peanuts, talk with the veterinarian. He or she can help you determine if peanuts will suit your dog’s condition. He can also make recommendations about the servings and frequencies of peanut treats. For first-timers, always follow the rule of thumb when it comes to non-traditional dog foods; introduce them in limited amounts. As long as it is fresh, unflavored, unsalted, unshelled and given in reasonable portion, peanuts are ideal treats for your precious pet. Chew bones and edible toys are quite expensive. 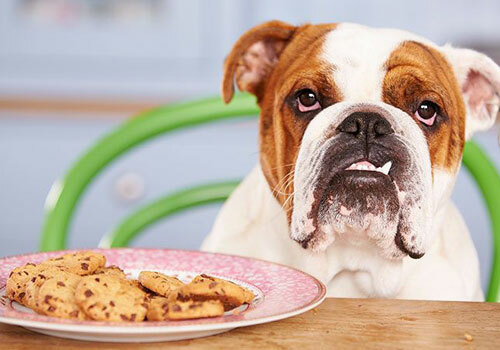 Why not try peanut butter the next time you’ll give Fido a reward?